Six games in and the Aviva Premiership continues to deliver spellbinding rugby from some of the top players in the game. As the domestic campaign takes a step back for a few weeks to make way for the new European season, now seems like the perfect time to analyse this year’s competitors. Unsurprisingly, six games in, the champions of last year Northampton once again lead the way, starting as they finished with some blistering performances against Gloucester, Sale and Newcastle along with narrow victories over Bath and London Irish. Their only blemish of the season coming in a narrow away defeat to Wasps, the Midlands outfit look determined to retain their crown, and with a squad as talented as theirs, many are tipping them to do just that. A dominant, aggressive pack of forwards led superbly by the likes of Samu Manoa and Tom Wood, look capable of smashing any team on their day with their monstrous power. 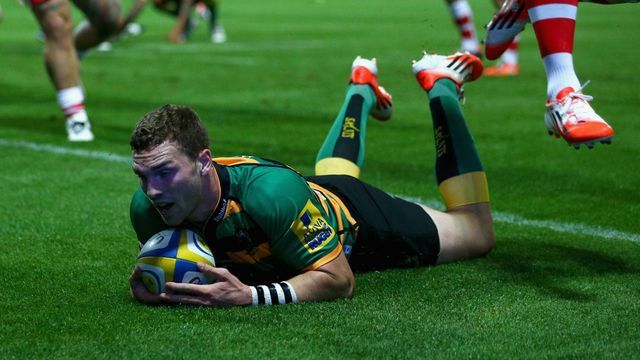 While outside them the silky skills and devastating pace of a back-line including George North and Luther Burrell, and marshalled confidently by the reliable Stephen Myler, have led to the Saints racking up the points in unforgiving fashion as they storm to the top of the table. Behind the champions, and occupying the rest of the top four, Saracens, Exeter and Bath have all made encouraging starts to the season. Following the departure of Steve Borthwick as captain, the pressure seemed on for new captain Alistair Hargreaves and his men as they looked to make up for last season’s near misses. However, the former champions have made their usual strong start to the season with the highlight being their barnstorming 39-0 victory over London rivals Harlequins at the Stoop in round two. Sitting comfortably in second place with their only defeat coming on the road to Bath, Mark McCall’s men once again look ready to fight all the way for this year’s title. As for Exeter, Rob Baxter’s side continue to punch above their weight with the likes of Henry Slade, Dave Ewers and Sam Hill tormenting opposition defences and providing another solid start to a season which promises much, with their comprehensive victory over Harlequins being the highlight so far. Sitting comfortably in 4th place, Mike Ford’s Bath look to have taken the experience of last season on board and have come back more determined than ever to finish the season in those top four places. A team full of promising youngsters such as George Ford and Anthony Watson, Bath have arguably made the most impressive start with convincing victories over Saracens and Leicester, while also running champions Northampton mightily close at Franklins Gardens by leaving with a well-deserved losing bonus point. For perennial title contenders Leicester and Harlequins, inconsistency has been the main worry. A Leicester side ravaged with injuries started the season with two wins from two, only to lose three on the bounce including hammerings at Bath (45-0) and Gloucester (33-16). A narrow victory over a Harlequins side, who have been equally disappointing after resounding defeats against Saracens and Exeter respectively, took the pressure off boss Richard Cockerill slightly, but both sets of teams will know much improvement is needed to challenge the leaders. After that chastening defeat at Northampton in the opening round, and after the vast change in personnel in the summer, Gloucester are starting to find their feet with new signings John Afoa, Greig Laidlaw and James Hook contributing to a solid start to the season. Amid all the hysteria over the controversial move to Coventry, London Wasps have started the season effectively with some morale-boosting victories over Bath and Northampton leaving them in a comfortable position in 5th. While for the likes of Sale, London Irish and Newcastle some encouraging results against the bigger teams have left them with something to build upon as the unfortunate London Welsh sit at the bottom following six demoralising defeats which already have them fearing the worst. ← New Dragons, same old problems!